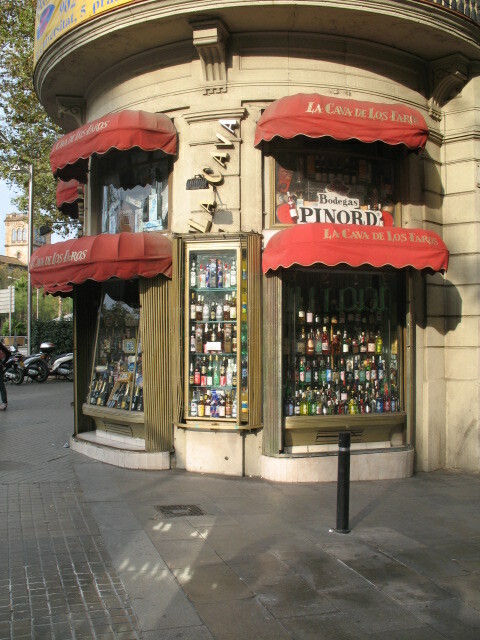 Fine Spirits Corner (Cava de los Faros) is located in Barcelona - Plaza Universidad, nº 5. Lots of goodies there. 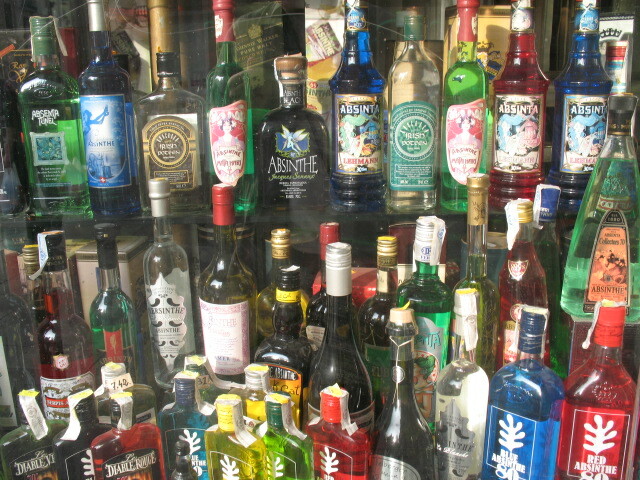 Also, several absinthe bars in the bohemian section off of the east side of Las Ramblas. You won't find much good absinthe though. Mostly Czech stuff. In Barcelona, along with all of the normal sites to see, don't miss a stroll through the market. Mercat San Josep (Mercado de San Jose), or more popularly known as La Boqueria. The entrance is located on Las Ramblas on the east side of the street, in the Raval District. It's tough to miss while you're walking along that Paseo. It truly is one of the most amazing markets I've EVER seen. Try to make your way through the whole thing. The seafood and fruit sections are the best, but there's also some good cafes on the back side where you can get a lot of really good spanish classics and maybe even drink some absinthe. I made it to Spirits Corner, in Barcelona, the real store. 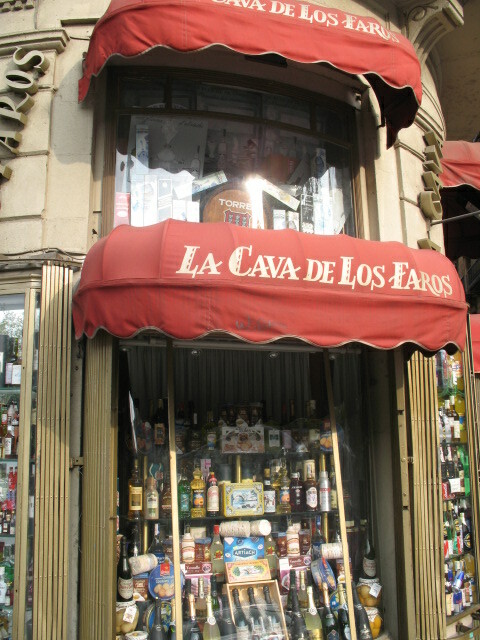 It is called "La Cava de Los Faros." After walking a few miles to the location, I arrived to a closed store. I was pissed. 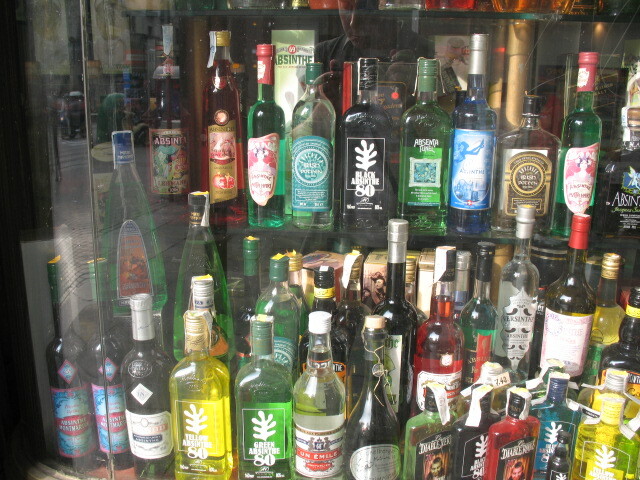 All this absinthe in the window, and I couldn't get in. However, all stores in Barcelona randomly close throughout the afternoon for extended lunches... or something like that. So I had a few cigs, waited around, and sure enough, the shopkeepers came back and reopened it. There were two elderly folks, a man and a woman. I told them I had purchased from them before, but they did not recognize my name (I haven't ordered from them in years). I only bought a bottle of Montmarte from them while in the store. This picture is the left side of their main ABSINTHE window. This is the right side of the absinthe window. Here we have another VERY popular absinthe in Barcelona, and in the other cities I visited. 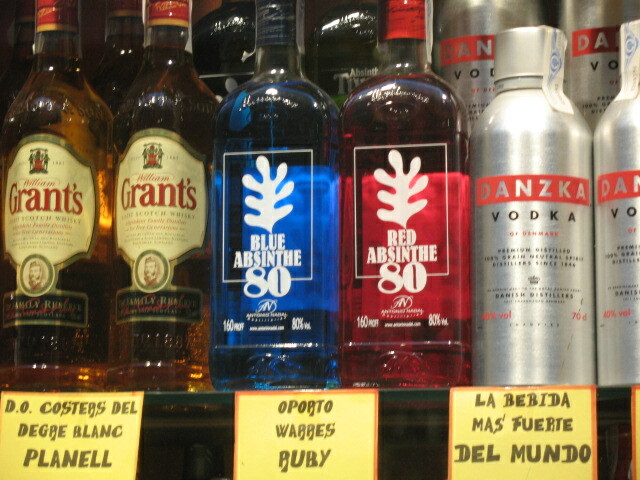 Blue and Red Absinthe. I have found a couple of shops in Barcelona where you can buy Obsello - just Obsello. Not a great variety, but hey, if you just happen to be around... Maybe they'll expand. I've always enjoyed visiting Spain. Any part of it. Planning on hopefully going back in the Spring. I'd empty the Clandestine, Mansinthe, Un Emile, and the Montmartre before I put them in the window... you know to protect 'em from the sunlight. Husband is in Barcelona today and offered to buy absinthe from me. I told him to go to La Cava de los Faros, and to purchase either La Clandestine or Mansinthe (saw those available on the website). They told him they were out of Mansinthe, and that they could get for him Clandestine for Saturday, but he leaves the city tomorrow, so there was no time. And then they tried the thujone sales speech with him, saying that thujone is the only thing that matters in absinthe, that the French remove all thujone contents from their absinthes. Husband said he had to bite his tongue to not say that La Clandestine is Swiss. The Spanish speaking world could well use a good forum and website like WS in Spanish. Indeed! I recently told someone I enjoyed absinthe, and he told me that his friends took him to a bar where he was served an awful-tasting shot of absinthe. I put my teaching hat and proceeded to explain the basics: that absinthe had to be diluted, that it should taste of anise to begin with... He was not convinced by my explanations, though. I should insist that he seeks the name of the bar for me, so I can check it myself (he did not remember it). I have purchased until now three Spanish absinthes, Obsello, Deva and Lasala. Deva and Lasala, I like them both, but I guess it is because I love the strong anise taste. It's very difficult to find anything else in them, apart from a slight bitterness. I liked the Obsello too, so different from the other two, but it's becoming more difficult to find here, even online. I just checked on their website and it states that "Offices are located at Passatge Sant Bernat 3-5 bajos 08001 Barcelona", but it does not say if they are selling to passers-by or if the offices are just for business matters. Google street view does not provide a pic of a store front. They still sell via internet though. Carrer Sant Carles 36, Barcelona. I did not visit mainly because they burn the absinthe. They state in their website that "in 1897 a police raid discovered the existance of a clandestine place in a discreet corner where sailors and artists drank the then forbidden absinthe". I would have had many problems talking with the people in these place. They sell their own concoction in a shop, but they do not offer an absinthe menu on the website, so I thought it would be a waste of the little time we had. Anyone visited it? Also, there are plenty of souvenir shops in the Barrio Gotico selling a box of two small bottles of "Absenta Calavera". They were neon green and black, so I did not bother. I've been to the Absenta bar, and they mostly serve bohemian styles. When I went back in February 2017 they had Pernod, but everthing else was non-traditional. Had a great time, and proceeded to be more inebriated than I've ever been in my life off of 7 very affordable glasses, partly because of extremely generous pours by the bartender (full glasses 1:1 ratio). The food and the atmosphere are great and I would highly reccommend it to someone looking for a "good" non-traditional fire-ritual heavy experience.